Here is a solution to tile M3 programs in Smart Office. It is a Tiling window manager for Smart Office with automatic scaling, placement, and arrangement of windows, for example to organize M3 programs horizontally across the screen. This solution is useful for example to put side by side two programs that a user might often use, for example Customer Order. Open Toolbox – OIS300 to see all the orders in M3, and Batch Customer Order. 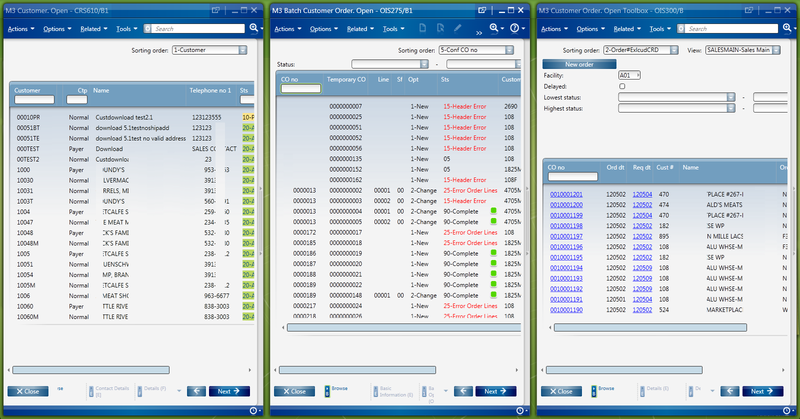 Open – OIS275 to see problems with those orders. A user might want to put the two windows side by side to monitor the orders. If a user does that every day, she might want a solution to tile the programs automatically. This solution will enhance the user experience and will contribute to increase user productivity. Here is a screenshot of the result that shows three windows tiled horizontally. It’s just for illustration purposes as the windows look crowded with my low resolution screen; in a real scenario two windows or a bigger screen would look better. If you liked this solution, I invite you to subscribe to this blog. Also, read the follow-up to this post with Stand-alone scripts for Smart Office where I convert this Tiling Window Manager into a widget-like script. Special thanks to Karinpb for the help. Is there a way to run this script from a button on the canvas? I want to create new window using jscript.net . when i used HostWindow and add ListView Control , that ListView Control doesn’t have default Lso theme , i checked mms001 program using inspector , it is open as EmbeddedHostWindow. please help me .